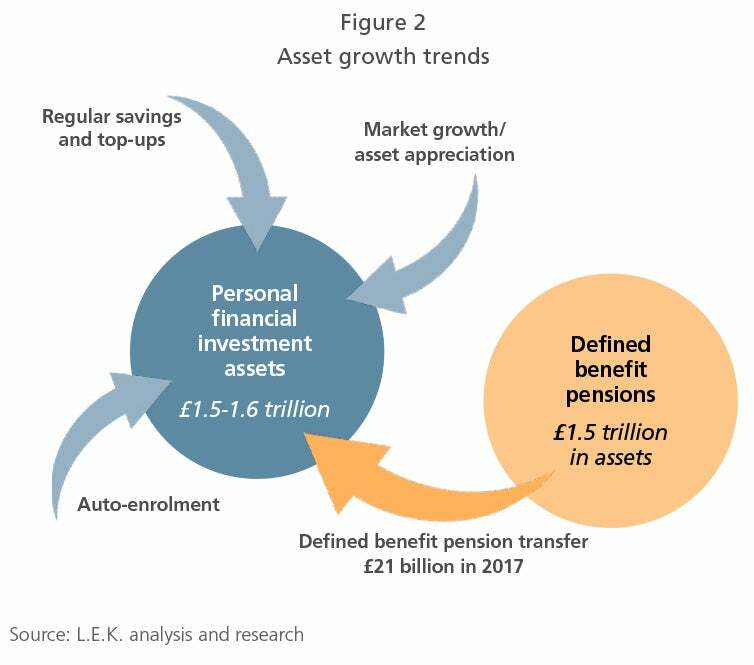 U.K. wealth management is a trillion pound market, with £1.6 trillion of personal liquid investable financial assets held by U.K. households and £1.5 trillion residing in defined benefit pension assets. The industry structure operates across three principal layers: client management, investment platforms and investment vehicles. The market is continuing to grow due to favourable asset growth trends: market growth/asset appreciation, regular savings and top-ups, auto-enrolment and defined benefit pension transfers in 2017. Wealth management has been subject to significant change in the past decade, with regulation and technology shaping business models, enabling superior client propositions and influencing profit pools. As private capital seeks exits in public markets, the need for organic growth, vertical integration and consolidation will amplify, enabling significant further value creation. There are very few trillion-pound markets in the U.K., but wealth management is one of them. L.E.K. Consulting estimates that there are c. £1.6 trillion of personal liquid investable financial assets held by U.K. households, with a further £1.5 trillion residing in defined benefit (DB) pension assets. Over the past few years, the wealth management market has been subject to significant change, as regulation and technology shape business models, enable superior client propositions and influence profit pools. In this Executive Insights, L.E.K. examines the U.K. wealth management market and explains why it presents a fertile ground for growth and value creation for industry operators and investors. The wealth management industry has traditionally operated across three principal functional layers. 1. The client management layer is key for a number of crucial value-adding activities, including client relationship management, proposition development, client risk assessment and portfolio design. This layer includes the spectrum of financial advisers — financial advisers, discretionary fund managers and private banks — as well as self-managed, do-it-yourself investment platforms. C. £1 trillion of client assets are managed by the advisory community (see Figure 1, client management). Together, these form the bulk of the wealth for mass affluent and high net worth individuals. Large financial institutions, such as banks and insurance companies, have traditionally held fringe positions. Master trust providers managing auto-enrolment pensions are currently minor players and could, in time, manage a more significant proportion of assets. 2. Client assets are invested through the investment platforms layer (see Figure 1, investment platforms), which provides the backbone of the industry. Businesses in this layer range from third-party B2B adviser investment platforms to proprietary platforms built in-house or leveraging technology capabilities from providers such as FNZ, SEI and Pershing. A range of supporting businesses also operates in this layer, including self-invested personal pension administration providers. The B2B platform market has been a significant beneficiary of asset migration to technology platforms in recent years, but this is now beginning to tail off. 3. The third layer is the investment vehicles layer (see Figure 1, investment vehicles) — this is the realm of the asset management industry at the receiving end of trends in the value chain. The number and wealth of mass affluent and high net worth individuals in the U.K. has grown consistently, with only minor blips during recessions. House price appreciation, low debt rates and a favourable economy have all supported wealth creation and appreciation. In addition, the industry continues to benefit from a number of favourable asset growth trends (see Figure 2). Pressure on public finances created by an ageing population is well documented, with successive governments using policy levers to shift responsibility for providing retirement income from the state to the individual. Increasing savings and investments is increasingly a ‘top of mind’ issue for many in the workforce today. Pensions reform, enacted in 2014, provides individuals with new freedoms to access and manage their pension assets. In particular, individuals may transfer their DB pensions into other pension wrappers (e.g., SIPPs), which are serviceable by wealth managers. While this has reduced after an initial burst of activity, DB transfers of £21 billion entered the wealth management industry in 2017. There is still significant headroom when one considers the substantial stock of DB assets outstanding — c. £1.5 trillion in 2017. Compulsory pension auto-enrolment has created a new vehicle for pension asset accumulation in the industry. From April 2019, employees and employers are required to contribute 8% of salary p.a., which in 10 years could accumulate into significant savings for many people. In an environment where financial planning and investments have become increasingly complex, the need for advice has never been more pronounced. Our publication Four Steps to Developing a Winning Wealth Management Proposition for an Ageing Population highlighted that over 80% of U.K. consumers felt they needed financial advice, but only 20% sought it. While there is much noise surrounding ‘robo-advisors’, the concept has failed to achieve scale, in particular in the wealthier client segments where human-to-human interactions are still highly valued. FAs provide this valuable and trusted service to clients, underscoring the importance of owning the customer relationship in emerging business models and allowing management teams to carve their own destiny rather than react to trends. After a period of regulatory change, the industry’s numbers have recovered to c. 26,000 advisers. While still in short supply, ongoing consolidation has allowed the industry to create value in its businesses by doing more with less. Yet despite the activity of recent years, the FA industry remains relatively fragmented, and there is still significant headroom to further roll up business models and strategies (see Figure 3). The past decade has been a landmark period of change. Regulatory change — in particular, the Retail Distribution Review — shone a spotlight on inefficiencies in the market and suboptimal customer outcomes. As a result, the fragmented (and ageing) cottage industry of financial advisers and discretionary wealth managers became more receptive to consolidation, triggering a wave of private capital to bankroll forward-thinking management teams. A significant amount of value was created through cost (and some revenue) synergies because of consolidation. However, as scale increases, consolidation at the client management layer of the value chain has diminishing returns because financial planning itself has limited scalability. Technology has played an important role in moving the consolidation dialogue further by reducing the cost of intermediation and portfolio design. This allowed vertically integrated wealth managers to emerge at much lower scales than has ever been possible. Operating investments through a combination of model portfolios, multi-asset funds and segregated portfolios, the premise of these businesses is based on providing both a (less scalable) financial planning service and a (highly scalable) investment management service. Instead of only mostly cost synergies, vertical integration has enabled revenue synergies of up to 100 basis points in consolidation events. Multiple flavours of vertical integration have emerged, but they largely mirror the above strategy, with the exception of asset managers who have recently forward-integrated with technology providers to access and protect upstream markets and flows (see Figure 4). Being vertically integrated is increasingly ‘table stakes’ if one wants to participate in the FA consolidation game. FA book valuations, which a decade ago were around 1% of assets under management, have crept up to over 2.5% to 3%. The only way for acquirers to break even in a reasonable period is to have a profit engine that monetizes all layers of the value chain — including financial planning, platforms, model portfolios and/or sub-advised funds. Several years into an expansionary cycle, it is natural to ask what has been the impact of economic downturns. History demonstrates the long-term stability of the U.K. wealth management industry, despite recent stock market volatility, and the evolution of regulation has led to an incentive-aligned, asset-based pricing model. The advisory community’s primary focus is on asset protection, and L.E.K. research has shown that it has been largely able to insulate itself from the full impact of historical stock market declines (see Figure 5). Value-creation opportunities remain significant for both current and new participants in the U.K. wealth management industry. The industry remains in a state of flux and business models continue to evolve, but businesses still lack agility and embedded technology. Customers are often exposed to a ‘one size fits all’ approach that is neither desired by the client nor optimal for the provider. The full power of technology to harmonise business processes is also still to be realised. These represent as much an opportunity as a threat to current market participants. In addition to vertical integration and consolidation, the need for organic growth will only be amplified in the coming years as private capital seeks exits in public markets. L.E.K. sees the role of technology-enabled business models and customer management sophistication growing as a result, while enabling significant further value creation in the industry.